Pumpkin - Vegetable absolutely stunning! A couple of years ago I could not even think of it, you can cook many dishes (before eating it just baked and dairy porridge) and spicy pasta with blue cheeseand pumpkin gnocchiand Diet wafersand cupcakes and much more. Chocolate cake with pumpkin - my new favorite this fall. Ingredients for the most simple, and the result is simply stunning: texture soft, damp (as in all baking, where there is pumpkin puree), slightly porous. Taste - chocolate, moderately sweet (although there is, of course, it all depends on how much sugar / syrup you add :). If you, like me, all that I have described above for the soul, the chocolate cake with pumpkin you will like it! Yes, one small remark: be sure to cool before serving (and before removing from the mold, as hot as its texture is very soft!). Cupcake delicious pumpkin is served cold from the refrigerator (the taste becomes more saturated). 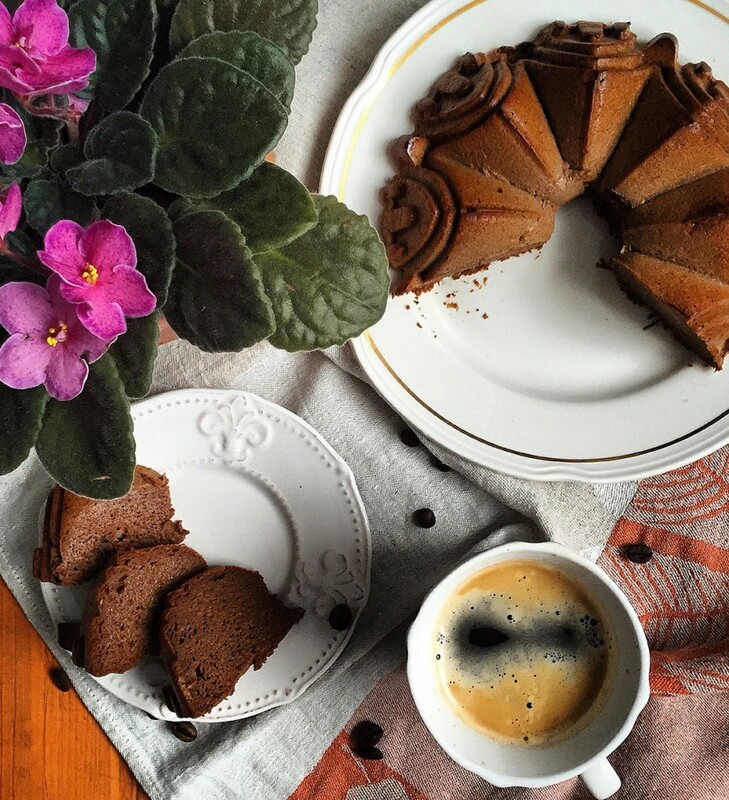 I recommend to cook chocolate cake with pumpkin evening, cool, remove from the mold, after - put into the refrigerator, and in the morning to pour a cup of tea or coffee and enjoy it with a slice of wonderful cake. sugar / stevia - to taste. *Powdered milk is usually replaced I do not recommend, consistency is not the same. If you do not have it, it is better to put more flour (available as an option, a protein, if you buy sports nutrition) or a little soft cheese. **Oat flour can be replaced, if desired, top grade wheat or whole grain. Prepare pumpkin puree (pulp bake in the oven after using pyurirovat bledera). The proteins separate from the yolks. Beat them separately with a pinch of salt (or sugar, if you use it) until stable peaks as for meringue. Note: with sweetener or syrup proteins is not beating, you never get a solid foam! Connect the remaining ingredients with a blender until a smooth homogeneous state (pumpkin puree, egg yolks, cocoa, milk powder, flour, baking powder, vanilla, sugar / stevia). Be sure to try the dough into sweet (because the taste of pumpkin at all can be different, sometimes it is very sweet, and sometimes almost none). Carefully enter the beaten egg whites into the batter with a spatula. Pour the batter into the mold (silicone or the laid parchment) and bake in preheated oven 180 45 degree minutes. After turn off the oven, slightly open and hold there cupcake pumpkin still 15 minutes.